Home › All About God › How do I Love God with my Whole Heart? The title of this post is a spiritual conundrum submitted by a reader named Sheena. It is also a question with many answers. It’s not so hard to figure out how to love our neighbor as we love ourselves (though it’s a lot harder to actually do it). But how do we love God? And how do we love God with all our heart, soul, and mind? Let’s look a little more closely at each one. But first, it might help if we have some idea of what this love thing is. We talk about love all the time. We sing songs about love. We write novels about love. We crank out movies and TV programs about love. We make jokes about love. We’re happy when we find love, and heartbroken when we lose it. But do we know what love is? When we stop to think about it, love is a hard thing to pin down. What the heck is love, anyway? A feeling? An attraction? A passion? If we try to think it out, all of these common ideas about love seem fleeting and insubstantial. And yet, we are driven by love. Our whole life revolves around love. Love is what gives our life meaning. For love to be that important, it must be more than some wispy feeling. In fact, love is the basic substance of God. This means that love is what both we and the entire universe come from. Love is not just some feeling. Love is at the core of our existence. Love is our very life. To read how Emanuel Swedenborg (1688–1772) put it, see Divine Love and Wisdom #1. Notice that John says not only that God loves us, but that God is love. In other words, love is both a power of God reaching out to us and the substance of God. Since the universe comes from God, this means that everything in the universe comes from the substance and power of God’s love. Yeah, but what is love? Okay, I admit, that’s kind of abstract. But it’s important to realize that love is not just a pleasant add-on to our life. It is the reality, substance, and power of our life. In a very real way, love is our life. It’s that basic to who and what we are. When we talk about loving God and loving our neighbor, we’re talking about something that is basic to our existence as human beings. Whole libraries would not be enough to say in detail exactly what love is. But we don’t have that much time right now. So let’s just take a quick look at a few of the things love is. Yes, love is beautiful, and all that. But what I mean is that love is a force attracts two beings to one another, and brings them together. In the physical universe, gravity is an all-pervasive force that attracts bodies of any mass toward one another according to how massive they are, and how close they are to one another. In the spiritual universe—which includes the human mind and human community—love works in exactly the same way. It is an all-pervasive force that attracts us toward one another depending on how much of it we have, and how close we are to one another. In plain language, the more we love someone or something, the closer we want to be to that person or thing. Love draws us toward one another, and joins us together. Of course, there is such a thing as one-way love. We may love someone who does not love us. However, love in the fullest sense is mutual. It includes not only loving someone else, but also being loved by them as well. That is the only way love can truly unite us with one another. If we love someone, we want them to have the good things that we have. But even more than that, it means that we want to give them our care and affection, our understanding and wisdom, our humor, our happiness, our contentment. And yet, what gives others joy is not always the same as what gives us joy. In an even finer sense, love is a sense of happiness and joy in the other person’s joy, even if it isn’t something we would enjoy on our own. We’re all different. We each feel joy in our own unique way. Real love does not expect others to be happy because they’re just like us and want the same things we do. Real love seeks an understanding of what truly makes the other person happy and what gives them joy, and feeling joy within ourselves when they experience their own unique joys. In other words, real love values the differences and uniqueness of the other person, and wants the other person to be happy in their own best self. To read how Emanuel Swedenborg put these things, see Divine Love and Wisdom #47. That’s enough for now on the nature of love. Let’s move on to some of the ways we can love God with our whole heart. This one comes straight from the Bible. As a child, if you loved your parents you would want to do what they asked you to do—even if it wasn’t exactly what you wanted to do at that point. If you love another person and they ask you to do something, you feel a certain joy and satisfaction in doing it for them even if in itself it isn’t the most pleasant of tasks. In the very same way, if we love God we will want to do what God asks us to do. Yes, I know. It says keep God’s commandments. But realistically, we don’t have to do what God commands us to do. We can decide not to. So if we think of it as God asking us to do this and not to do that, then it’s really the same as someone we love asking us to do something, or asking us not to do something that they don’t like. It’s true that sometimes—perhaps often—what God is commanding us to do is exactly what we don’t want to do, and what God is commanding us not to do is precisely what we do want to do. But if we truly want to love God with our whole heart, we will set our mind and our heart on doing what God wants us to do, and not doing what God doesn’t want us to do, as we understand it. This one also comes from the Bible. You see, God loves every single one of the people that God has created. God feels joy when even the least, most broken down of us feels some small bit of happiness, contentment, and love. Every time we do something for one of God’s creatures—not only human, but also animal, plant, and even inanimate rocks and soil—we are doing it for God, and giving God joy. In a very real way, every small act of service, kindness, thoughtfulness, and caring that we do for someone else is an act of loving God. That’s why Jesus said that the second greatest commandment is like the first. When we love our neighbor as we love ourselves, we are also loving God with our whole heart, soul, and mind. Okay, let’s admit it. Some of the things we feel joy in are not the sort of thing God feels joy in. For example, it’s natural for us humans to feel pleasure when someone who has hurt us feels pain. We want to get back at them for what they did to us. We want them to feel the pain they have caused us to feel. But that’s not the sort of thing God feels joy in. When Jesus was on the cross, as he looked down at those who were causing him such great pain, what did he say? Did he curse them and wish a miserable death upon them? God takes no pleasure in the pain or the death of those who have made themselves into God’s enemies by doing all sorts of evil and destructive things. Rather, God’s desire is always for them to turn away from their evil and destructive ways so that they can experience true joy and happiness. If we wish to love God with our whole heart, instead of wishing pain and death on those who have hurt us, we will wish and hope that they will realize and regret the wrongs they have done so that they can turn from them and begin to experience a life of happiness and joy. This is just one example of how loving God is feeling joy in the things God feels joy in. As we learn more and more about what God is like and what gives God joy, we can learn to feel joy in the same things God feels joy in. The more we do this, the more we will be loving God with our whole heart. 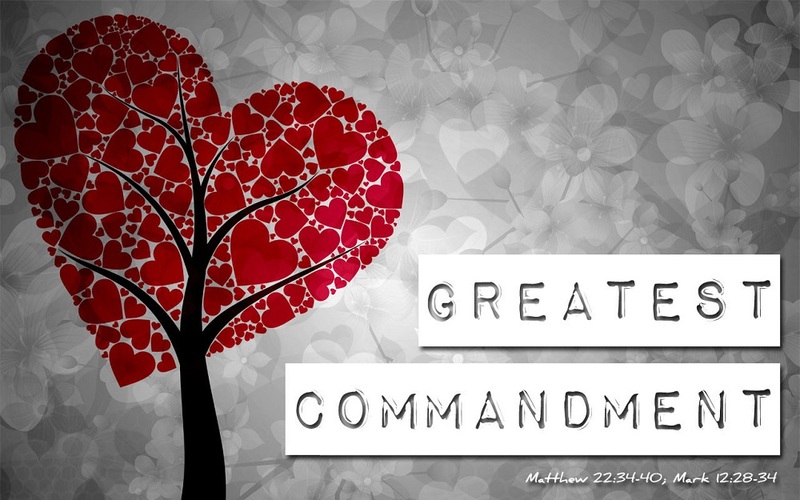 Jesus said that loving the Lord our God is the first and greatest commandment. We are commanded to love our neighbor as we love ourselves. But we are commanded to love God with our whole heart, soul, and mind. Another way of saying this is that we are to love God more than we love anyone or anything else—including both our neighbor and ourselves. We are to love God more than we love our best friend. We are to love God more than we love our parents. We are to love God more than we love our children. We are to love God more than we love our husband or wife. By putting God first in our life. By putting God’s will before the will of anyone else, and even before our own will. If we wish to love God with our whole heart, we must give God first priority in everything we do. If your best friend asks you to do something that you know is contrary to God’s will, you must follow God, not your best friend. If your parents are holding you back or leading you toward something you know is not what God wants for you, God’s plan for your life must take precedence. If your children are acting in selfish, greedy, and destructive ways, you must resist the urge to excuse and justify their bad behavior, and instead hold them to the same moral and spiritual standards that God would hold them to. If you face a choice between your wife’s or husband’s will and God’s will, even then, God’s will must come first. Of course, these things do depend on how well we understand of God’s will. If our idea of what God wants is mistaken, it will result in wrong choices and wrong actions. Along with our dedication to putting God’s will first, we must also devote ourselves to continually learning more about what God’s will is. The more our understanding of God grows, the more effective we will be in putting God first in our life. In order to love God with our whole heart, we must give our whole heart and our whole life to God. This doesn’t mean we can’t love anyone else. Just the opposite. God loves all people. The more we love God, the more we will truly love our friends, our family, our coworkers, and everyone else we encounter. But more specifically, giving our life to God means searching for the reason God created us, and devoting our lives to it. Each one of us is a unique creation of God. We were born of unique parents, we grew up in unique circumstances, and we have a unique character as a result. This means that each one of us is able to do something that no one else can do quite as well as we can. It may be a great thing or it may be a humble thing, but it is our thing to do with our life. It is what God put us here to do. Though it may be a lot of hard work to discover and do what we are put here to do, it will not be something that’s impossible for us to do. The reason it’s our thing to do is that we are uniquely gifted and qualified for it. We have the specific personality, skills, and experiences that we need in order to do it—and any that we don’t yet have, we can go out and get. By giving our life to God, we are also devoting our life to being uniquely ourselves in the best way possible. God is not just some impersonal force pervading the universe. Yes, for us, being human generally involves having arms, legs, eyes, ears, internal organs, and so on. But even more than that, being human means having self-awareness, love, compassion, ideas, understanding, motives, freedom, responsibility, and all of the other mental and emotional characteristics that make us truly human. One thing it means is we can have a personal relationship with God. For Christians, this means having a personal relationship with Jesus Christ, who is God’s presence with us. If God is love, then having a personal relationship with God and loving God with our whole heart also means opening up our whole heart to receive God’s love. Opening your mind, and especially your heart, to receive God’s love is one of the most personal ways of loving God with your whole heart. God loves you and wants to have a personal relationship with you. How will this happen? It’s not something that can really be explained in words. It’s something you just have to experience for yourself. And it’s different for each person. If you need some help, I encourage you to read the Gospels, paying special attention to all the places that talk about God’s love. The three letters of John in the New Testament also offer some beautiful thoughts about God’s love. If you can begin to feel that God truly is a personal, loving, and wise being, and that God truly does care about you and your life, it will be easier to open your heart to receive God’s love as it flows into your life. When you feel God’s love in your heart, you will also feel a love for God that goes deeper than anything else in this life. That’s because we are created from God’s love, and God’s love is our true home. When you feel God’s love in your heart, it will also fill you with more love for those around you than you have ever felt before. That’s because God’s love is a love that wants the best for every single person, and sees the best in everyone and everything. These are a few of my thoughts about how to love God with your whole heart. But it’s a list of only six different ways. If we were to take a cue from Elizabeth Barrett Browning, and try to count all the ways we can love God, we would soon find that they are countless. God is infinite. There is no end to the ways God loves us. And there are at least as many different ways for us to love God as there are different people on this earth. What are some of the ways you have found to love God with your whole heart? Love the focus on love on this blog! Here’s a nice definition of love I came across: Love = ascribing worth to someone. Thank you. That’s a great one! Great article, Lee. It really helps me understand this important subject. Thanks. Nice to hear from you again! I hope your life is moving forward now. You said in your post that “God is human”. I agree with many things that you say on this page but I don’t agree with you on that. To be human means to be an imperfect creature and not only that- since Adam and Eve are responsible for mankind’s first act of sin and disobedience (eating of the fruit of Knowledge of Good and Evil) every human has a sinful nature. The wages of sin is death so God sent His only Son Jesus to take away the sins of the world so that we can be reconciled to Him. Jesus paid the ransom for our debts on that cross. God IS perfect and does NOT have a sinful nature. Yes, Jesus was in the flesh when He was on earth but He was holy because the Holy Spirit came upon Mary his mother (Luke 1:35). Numbers 23:19 “God is not human, that he should lie, not a human being, that he should change his mind.” Please consider these things before you write something and pass it off as truth for other believers to read when they desire to pursue a closer relationship with God. But God’s humanity is infinite, divine, perfect, sinless, omnipotent, and all-loving. For God, being “human” means being perfectly loving, perfectly wise, and perfectly powerful. So it is a different kind of humanity than we have. So we are limited, finite, imperfect humans because God is an infinite and perfect human being. Numbers 23:19 is saying that God is not the sort of finite, imperfect human being that we are—”mortals,” in some translations. The Greek word used here is anthropos, which is not the word for a man, as in a male, but the word for a human being. Jesus was, in effect, saying, “See, this is what a human being truly looks like.” In the way he meant it, God, in Christ, is the only truly human being. So yes, God is human, at a far higher level than we are. We are imperfect copies of the only truly human being, meaning the only truly loving, wise, and powerful being in the universe. We are human only because God is human. On your other point, yes, Jesus came to take away the sins of the world (John 1:29). But he did not do this by paying the penalty for our sins, if that’s how you interpret “ransom.” The word “pay” does not occur in the Bible together with “ransom” or “sin”—at least, not in the way that Protestants commonly teach. The idea that Jesus paid the penalty for our sins is a false, non-Biblical doctrine. For more on this, please see the article: Did Jesus Really Die to Pay the Penalty for our Sins?!? Thanks again for your comment. I hope you will consider these things in your own mind, and read the Bible carefully to see what it actually says about God, Christ, redemption, and salvation. On these subjects, please read the article: Who is God? Who is Jesus Christ? What about that Holy Spirit? Love is a slippery slope. If you are a people pleaser in Christ, compassion fatigue sets in quick. Life in America is often caught up in the cog of maintaing the status quo (making money), and the whirlwind of unecessary obligations put on us by selfish and inconsiderate people (believers and unbelivers alike). I work hard, and I love my God with all my heart, soul, mind and strength. Putting Christ first can be seen by friends and family as selfish. So all this lovey dovey talk sounds good on paper. But, we exist in a different era than biblical times when. I am learning the greatest robbers of time are in fact brothers and sisters in Christ. Go figure. Thanks for your comment. It does sound like you’re struggling in life. Though it may sound counterintuitive, often putting Christ first means not doing what everyone around us thinks we should do, but following our own course even when it goes against the grain of the society. I don’t think it was any easier to follow Christ against society in Biblical days than it is today. If anything, it was harder. So Christ isn’t asking us to do anything that his original disciples didn’t have to face. Maybe different in quality due to the different culture we live in, but not different in degree. I have no easy answers for your predicament. But I would suggest that you ponder and meditate and pray within yourself what exactly it is that Christ wants you to do with your time and your life. There will always be people around you who want to tell you what you should be doing, and think they know better than you do what your life is for, or who just want to use you for every last drop they can get out of you. Running your life by their desires, demands, and expectations is not what it means to put Christ first. I do wish you strength and discernment to choose and follow a path that truly expresses Christ’s will for your life. Answer this question: Are you saying and do you believe that God the Father is a human being? If you mean a human being like us, born in the physical world and made of physical matter, then no, God is not a human being—though God did become a human being when born as Jesus Christ. Still, God is not a physical being made of physical matter, nor is God a spiritual being made of spiritual substance. God is a divine being made of divine substance, which is love (see 1 John 4:8, 16). However, God is a human being in the sense that the qualities that make us human—love, understanding, compassion, intelligence, and so on—are fully and infinitely present in God. In that sense, yes, God is a human being, and in fact is the only truly human being. We are created human in the image and likeness of God, and we are a finite, limited, and fallen version of the true humanity of God. You just said, “…Nor is God a spiritual being made of spiritual substance.” John 4:24- Jesus Himself said, “God is spirit, and his worshipers must worship in the Spirit and in truth.” You said, “God is human.” on this page. Numbers 23:19- “God is not human, that he should lie, not a human being, that he should change his mind.” You said in your first sentence of your comment, “God is not a human being.” and then in the next paragraph, “God is a human being in the sense…” Almost everything you say is a contradiction and the scripture (which is a fact) disproves most of what you’re saying. Yes, Jesus Christ was in the flesh and was both man and Son of God. God the Father is a god, the one and only God. There is God the Father, God the Son (Jesus) and God the Holy Spirit. Jesus Himself said that He is in the Father and the Father is in Him so they are One. So God is Spirit. If your only purpose here is to tell me I’m wrong, then you are violating our Comments Policy, and I’d ask you to go elsewhere. However, if you sincerely want a deeper understanding of the Bible and of God, I welcome your comments and questions. Your comment above represents a partial, selective, and shallow reading of the Bible. But I don’t fault you for that, since it is clearly derived from traditional Christian concepts of God, which are themselves not based on any deep and careful reading of the Bible, but on cherry-picking verses that seem to support traditional Christian concepts of God while ignoring or misinterpreting a vast number of passages that contradict them. About God being human, I plan to write an entire article on that subject, so I will only say here that the Bible contains extensive statements that present God as human. There are hundreds, if not thousands of such statements in the Bible. I will quote just a few of them in my upcoming article on the subject. About God not being a spirit, that is a trickier concept because it gets into abstract ideas that the Bible, especially the Old Testament, simply didn’t have the vocabulary to talk about. So the Bible had to use words like “human” and “spirit” in various ways in different contexts in order to triangulate, so to speak, the true nature of God for fallen and ignorant human beings. God is a spirit in the sense of not being a physical, flesh-and-blood being the way we are. But God is not a spirit in the same way that human spirits, angels, and heavenly beings in general are spirits. All of those beings are created, and thus lower than God. God is of a higher being and essence than they are. To equate God with the sort of spiritual beings that we and angels are is not only to lower God to the status of an angel or of an ordinary, created human being, but also to misunderstand the point that the Bible is making in John 4:24. If you read the context (John 4:1-42), you will see that Jesus is responding to the idea that God is supposed to be worshiped either on the mountain where he was talking to the Samaritan woman or in Jerusalem, both of which are physical places. Jesus’ point was that God is not a physical being made of material substance and located in some physical place, as was commonly believed by pagans and polytheists in ancient times, but is of a wholly higher order of (non-physical) being, who is present everywhere, and must be worshiped by humans in a spiritual way, not by physical rituals that are limited to some physical place such as the Temple in Jerusalem or the many other shrines that were commonly built on mountains by people of ancient times. I know you believe very strongly, as you have been taught, in the traditional Christian doctrine of a Trinity of Persons in God. But that doctrine is taught nowhere in the Bible. It was invented by human beings several centuries after the last books of the Bible were written. If you can free your mind of that false human doctrine, you will be able to see God in a much truer and deeper light, and understand much more clearly the Bible’s many statements about God. I invite you to read the above articles, and others on this site, to open your eyes to the true nature of God as presented in the Bible. So your comments policy states that people are only authorized to agree with you? Don’t you see anything wrong with that? What you’re saying is, even if you say something against the scriptures, you don’t want anyone in the world to go on your website and correct you? And nothing I said is false doctrine. Jesus is the Son of God. He is also One with his Father. He mentioned that God is His Father several times. And the Holy Spirit is God and Jesus, they are also One. Jesus said in John 10:30, “I and the Father are one.” He even questioned his disciples when they asked Him to show them the Father, “Do you not believe that I am in the Father, and the Father is in Me?”-John 14:10. 1 Corinthians 6:19 “Or do you not know that your body is the temple of the Holy Spirit, who is in you, whom ye have from God, and you are not your own?” Remember what Peter said in Acts 5:3-4? “But Peter said, “Ananias, why has Satan filled your heart to lie to the Holy Spirit and keep back part of the price of the land for yourself? While it remained, was it not your own? And after it was sold, was it not in your own control? Why have you conceived this thing in your heart? You have not lied to men but to God.” See how Peter said that they lied both to God and the Holy Spirit? To tell someone that they believe in false doctrine is a serious accusation, especially when you can’t prove that what they say is false doctrine with the scriptures. And I will not read anymore of your articles. I will pray for you, Lee. 6. We welcome your sincere questions, even if they challenge our views. 7. While we welcome corrections to any factual errors, comments whose primary purpose is “correct” our beliefs may be deleted at our discretion. If you wish to ask questions and even challenge my views, you are welcome to do so here as long as you do it respectfully. But if your intention is simply to tell me that I am wrong, that is not a conversation I am interested in having. I have spent a lifetime studying the Bible, and I am quite confident and comfortable in my understanding of its teachings. Thank you for your prayers. However, it would give me more joy if you would re-examine your non-Biblical views, invented by human beings, and consider the Biblical truths presented at this website. Yes, all of the things stated in the Bible about the Father, the Son, and the Holy Spirit are true. But the idea that this means there are three Persons of God is not taught by the Bible. If you do not believe that God is a Trinity of Persons, then I apologize for misunderstanding your views. And if that is the case, then I would be very interested to hear what you do believe about the Father, Son, and Holy Spirit. However, based on your statements, it sounds very much like you have accepted the non-Biblical doctrine of a Trinity of Persons in God. And that is the basis of my statement that you believe in false doctrine—because the Trinity of Persons is a doctrine invented by human beings in the third and fourth centuries, not a teaching of the Bible. Once again, please see: Father, Son, and Holy Spirit. Please also see: What is the Biblical basis for disbelief in the doctrine of the Trinity? yes agreed – Does God sometimes ‘remove you’ from some aspects of the world, in order to make it easier to focus? I was given some contrast at an early age to become a stronger character now and later decided I would have no family- I could have done – that wasn’t the issue, but instead my purpose has to become a teacher and to help other kids/families etc. It has been relatively easy to accept my path, although ‘the world’ would view one as ‘unconventional’. There’s a lot of pressure, especially for women to marry, etc at a certain age or comfort to a certain pattern? On that basis I used to think, ” what’s wrong with me? ” why am I different?” etc and feel like I had to do ‘x, y and z’ to be like others. My mum and dad are now ‘passed on’ and I’m not really swayed by friends opinions etc most of whose would not contradict with mine, but I have had some very real experiences of standing up to ‘evil’ in my life. so it is easy for me to put God first, but still have to check am not putting myself first or worries about worldy events and decisions and ego etc? I pray a lot and in a lot of ways feel like a kind of ‘warrior’ – not through my own strength but through a heart that wants to protect and help others and pray against injustice when I see it in ‘the world’. I identify very much with ‘strength’ – but obviously because of this ‘warrior angel’/’hero’ mentality ( laughing because this is what the ego is like!) I have to guard against spiritual pride, over-defensiveness and trying to control ” that ‘shouldn’t be happening God just get rid of evil now!” impatience/ kinds of thoughts? My soul march on with strength – Judges – not sure why as from the old testament? Thanks for stopping by, and for telling your story. We each have our own spiritual gifts. And it takes all kinds to make God’s kingdom work. Even if your way may be unconventional, you have a gift and a calling to pursue. It’s all doing God’s work. And it sounds like you have a pretty good handle on the spiritual and ego challenges involved. I feel horrible for admitting this, but I don’t really understand God’s love. I don’t know why or in what ways, I just feel like I don’t understand God. I don’t even know if I truly love or trust him with my whole heart, and I feel ashamed of that. I know I WANT to, but I don’t know if I actually do. I also don’t exactly know God PERSONALLY, so how am I suppose to know what God does and doesn’t want? I pray every day, more often than not multiple times. Whenever I get a feeling I should do something, I often feel like it’s God trying to tell me something. I don’t know if that relates to having a personal relationship and loving and trusting God, but I guess it’s something. And sometimes I don’t or wouldn’t do things regarding religion because I feel like it’ll be too overwhelming for me. I don’t read the bible because I feel like it’ll only hurt me than help me. I have a tendency to overthink and obsess over things. I’d probably take one verse that doesn’t make sense to me and obsess over it all day. Therefore, I would rather not read the bible. Is that the same as putting your own will first? Remember that life is a journey. You don’t get there in one step, in one day, in one year, or even in one decade. We have a lifetime to work on these things and travel toward our ideals. The main thing is that you want to know and love God, even if you’re not sure exactly how to do it, and exactly who God is and what God wants for you and your life. We learn and grow spiritually as we seek these things, and that is a lifelong process. So don’t be too hard on yourself. You’re still young, and really just starting out on the journey. As you travel it, things will gradually become more clear, and you will understand more and more, and feel God’s presence more and more in your heart. Thank you for stopping by, and for your kind words. Godspeed on your spiritual journey! Thanks for stopping by, and for your comment. I’m glad you enjoyed the article! Godspeed on your spiritual journey.